Discussion in 'Ad Campaigns' started by mikel, Jun 29, 2009. This male model gets too much area in it but i like the other things. Indeed, but it looks nice. I think the other girl is Guinevere by the way. Maybe the other girl is Naty C.
I adore the dreamy atmosphere, the colors, the poses, and the models obviously. 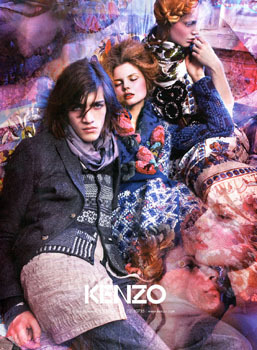 I wish Mario will photograph Kenzo ads for a long time. Magda again! Looks beautiful, very dreamy plus I love the colours. Yes! Magda's got the campaign again & she looks great ... this is pretty much the same as the SS campaign. Lovely, I'm glad they've kept the concept. Same concept of last season... I still like it. It does really look alike the SS ad,but it's still beautiful.The colours are really amazing. It's like a re-run of the S/S campaign (what with the casting, colours and mood) but I still like it quite a bit. Yay for Magda and Guinevere! Bigger for all to enjoy! Now it's obviously clear it's Guinevere. oh ,i love it!!!! !love the colors!! !